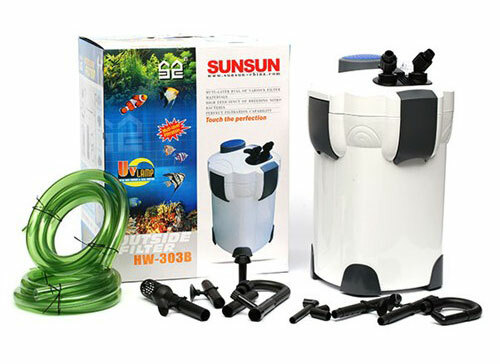 The SunSun HW-303B External Aquarium Filter system utilizes a multi-stage approach to filtration. Filtering aquarium tank water through three (3) internal layered baskets filled with assorted filter media material it provides extremely thorough biological, mechanical and chemical filtration. The three flexible media trays allow you to add other filtration media such as SunSun's activated carbons, ceramic rings or bio-balls (sold separately). By filtering your tank using the filter media you will observe a vastly improved level of waste-free water through extremely strong biological purification. The filter's easy-access layered filter media basket's make it simple to customize your media choices to suit your aquarium and fish livestock needs.